Even if actual bells – belonging to the church of the village of Hermigua, on the island of Gomera in the Canary arcipelago – are to be heard in this piece, they are not the “Campanas” (bells) the title refers to. Campanas is an expression used by the locals to identify locations on the island terrain – rich in canyons, ravines, steep and rocky valleys – that have a special resonance. Natural spaces that resonate, indeed, like bells and are used as amplifiers for the speakers of the peculiar whistled language “El Silbo”, a language enabling the gomeros to communicate even at four or five kilometer of distance from one another. El Silbo has already been at the center of my attention in 2003 when i came to Gomera to produce an early sound art piece titled “The Whistling Republic” for the Studio Akustische Kunst of WDR in Cologne. In that occasion I focused on the sonic qualities of that very language and submitted some poetical texts to the speakers in order to observe – and record – the way those phrases would have transformed while translated in that special idiom. This time around, “El Silbo” is just one of the many actors that populate the sonic landscape I am portraying, where the real protagonists are resonant spaces, echos, and the so called “backgrounds” or “atmos” in radio lingo. The sonic objects that are placed inside them are simply there to show the sonic shape of the space where they are contained. While listening you’ll notice a continuous variation and re-composition of sonic spaces. They alternate, sometimes in a gradual fashion, as it happens during a walk. Sometimes abruptly and in an unrealistic manner where i decided to use them as pure musical elements. Often I simply arranged them in a way that sounded interesting to me beyond the realistic depiction of a landscape. Since this new trip to Gomera has been a comeback I decided to bring sounds from my previous piece and to position them again inside the landscape. For a several days, together with my partner Audrey Chen that was assisting me on this project I walked all over the island looking for acoustically interesting spots and re-playing many sounds from my previous work. Most of times Audrey was several hundreds meter away from me with a portable sound system playing those sounds we selected from the “Whistling Republic” and that I re-recorded in this new acoustic setting. I often notice how the landscape disappears in front of our eyes and ears. I will make a visual example : till the romantic years the Alps where literally invisible. Not useful, dangerous, deserted beside some remote inhabitants they where just big white spots on the map. Cartographers didn’t even bother to draw them. Just with the change of sensibility brought by the romantic tremors people started to “look at them”. I believe this sort of “disappearances” still happen very often with all sorts of landscapes. And luckily so. Being constantly aware of the landscape may lead to a sensory overload. Something I noticed : Once wanting to reactivate this anesthetized perception a good trick would be that of placing a stranger object in the landscape allowing us to “see” it again. If we place Hannibal’s elephants on the alps, we see the alps again. If we would allow a crocodile to run free in the streets of berlin we may get a new perception of the architectural nature of the newly redesigned city. In this extent the work of Albanian artist Anri Sala placing horses in the most unlikely locations has caught my attention. Here I preferred to use visual examples although believe this being altogether true for the acoustic realm. We need to put something inside and acoustic space to perceive it. If we are transported in a pitch black space it would be enough to clap our hands to get a rough idea of the size, shape, materials of construction of the room we are or if we are in an open air location. Further interest and ambiguity arises if the something in question is allegedly familiar but in-fact a stranger element in a landscape, as for example would be putting a photo of the Mount Fuji in front of the real Mount Fuji and observing the two at the same time. This is again a visual example, an illustration but referring to the world of sound there is a piece that more than any other illustrates this principle. Sound Artist Alvin Lucier’s famous piece “I am sitting in a room” consists in the continuos replaying and re-recording of a simple spoken phrase in a given space. This ends by evidencing the resonant properties of the space, those empathized frequencies end up replacing and making the spoken text unintelligible. By the making of “Campanas” I was aware of those possibilities while experiencing the somehow exhilarating moment of re-staging the life of a preexisted, then transformed and re-imagined sound into it’s original environment. I was bringing back my sonorous thoughts, memories and projections to this island to whom I had dedicated a whole lot of mental attention in the past 6 years not even having been there once since 2003. Sound artists and composers are somehow solitary creatures spending a lot of time in the studio among their sounds. It happens to me, while working a lot with human voices that I would record a conversation and then work on it for for months in the studio. I would not meet the person i was talking to for all this time. This voice gets to be intimately familiar on a daily basis but in-fact I am not meeting this person every day. The person the voice belongs is still living his life somewhere else – it even may be dead – but I keep going back to the voice i know and that i fixed on tape and – eventually – more and more in my memory. When, and if, it finally happens that I would meet that person again it is usually quite emotional for me. I can experience how that voice is capable of saying other things that the one i know, or that I wanted it to say. I can experience how that voice belongs to a body that in the meanwhile has changed, went through time, aging and mood changes that had made that voice slightly or sometimes radically different in inflection, register or raucousness. 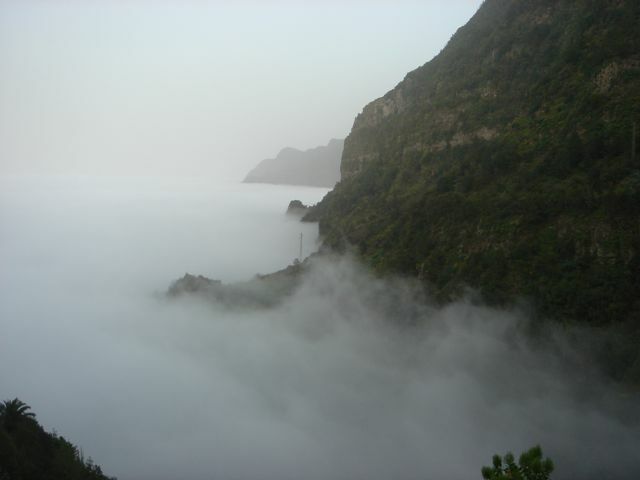 In the case of “Campanas” I experienced the same thing with the sonic landscape of Gomera that is the voice of this place. And the place had changed, so I noted down a little list of things that weren’t there the last time : a lot of water and moist, the color green, rainbows, death, fog, mr. placido etc.. The texts in the piece originate from those little perceived differences. Something unexpected happened while composing the piece and facing the difficulty of making this extremely site specific experience hearable on a tape piece : the landscape started talking to me. This made things easier, since I am so much more used to deal with language than with the so called soundscapes. Talk happened is a very literal way – although maybe just in my head while my composer’s hands were translating it. I should it not explain it further since it is something quite easy to figure out whilst the piece progresses. Something else happened while I was there. Somebody I was very close to passed away in my homeland. I knew this was about to happen before leaving and this looming possibility had been there during those days of recordings. It may have influenced the way I listened to the island. That day I went out for field recordings but I was awaiting for the phone call. The actual moment of the passing it was pouring rain and Audrey and I were recording, bare feet in the freezing water. It was inside a 500 meter long but very narrow tunnel cutting the mount Garagonay close to the El Cedro shelter. Somehow inside the hollow, resonating core if this place. This piece is dedicated to this now much missed person. The bells of Hermigua in “Campanas” may have also rang for her, making an elegy of this piece even before I could think about it.